Latest Jobs In Starbucks Dubai & KSA. Starbucks is one of the best known coffee chains in the world, dating back to 1971 when the first branch was opened in Seattle in the USA. Today, this chain has branches all over the globe and operates in more than 20,000 locations. Serving both hot and cold beverages as well as sweet and savory foods, this coffee brand is famous for its high level of customer service and highly customized drinks. One of the most prestigious coffee-related employers to work for, Starbucks offers an excellent working experience for its employees as well as attractive pay and conditions. In the Middle East, the Starbucks franchise is operated by M. H. Alshaya Co, a leading retailer in the region, and this company offers its workers a flexible approach to work as well as excellent opportunities for career progression and development. 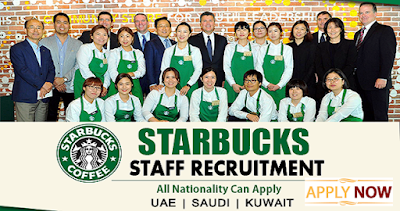 The latest jobs at all of the locations in Starbucks Dubai and KSA can be found on the company's own website as well as one several general job listing websites for the Middle East such as Gulf Job Careers, Dubai Jobs, Jobrapido and Bayt. The type of skills and experience required for the latest jobs in Starbucks Dubai & KSA depend very much on the position applied for, although usually some kind of similar experience is required for many roles. English language skills are also very important for lots of positions as well as a strong customer focus and excellent presentation and attitude. For higher level posts, at least 5 years of experience may be required as well as relevant qualifications such as industry recognized certificates or a degree in a relevant discipline. A valid UAE driving licence may be a pre-requisite for some positions, whereas for the highest level posts such as that of a district manager, proven evidence of successful management experience will be necessary. You can apply for posts at Starbucks in Dubai and KSA through the Starbucks Middle East page. This will direct you to the Alshaya website where you can view all positions, choose one that best suits your skills and in an appropriate location and then apply by setting up your own application account. You will first need to enter your email address in order to access the portal and then you can complete your application including your personal, educational and work experience details. You can submit the application online and it will be sent to a member of the recruitment team for perusal. They will determine whether or not you meet the requirements for the position and then potentially invite you to interview.